With Web Services and simple HTTP commands, you can retrieve information, and create or modify settings using Loxone’s Miniserver. control: can be any input or output, real or virtual. Outputs can only be used for status requests. value: when ‘value’ is not available, the current control value is returned. The following values ? ?allowed: ‘A’, ‘On’, ‘off’, ‘Off’, ‘Impulse’, ‘Pulse’ or a decimal value (<1). Virtual digital inputs with 2 outputs (up-down, left-right, starting from version 1.5.4.16), the following values are allowed. ‘On’ = 1 and ‘Off’ = 0 for digital inputs and outputs. Analogue (0-10V) inputs operate in a range between 0 and 10.00. There is no formal limit (for example EIB temperatures of 21.5 or -5.2). A dot is used for the decimal output. Before sending a pulse into the system, your Miniserver needs a Virtual Input that will accept the command. In this example we have the default credentials (username: admin, password: admin) and the virtual input in the command which has the name ‘Test Input’. By pressing the ‘Send’ button in the application, the string will use the IP address to find the Miniserver on the network, login and then process the command. Code “200” means the command was accepted and processed. *In these examples, Postman is the 3rd party app being used to send the commands. Function Returns the value at the requested outputs (either a unique value for all – or a ? for different values. Status requests via web service are only possible with inputs and outputs and are not possible with function blocks. Before sending a command into the system, your Miniserver needs a Push Button function block that will accept the command. In this example we have the default credentials (username: admin, password: admin) and the Push Button in the command which has the name ‘Push-Button’. By pressing the ‘Send’ button in the application, the string will use the IP address to find the Miniserver on the network, login and then process the command. We can change the last part of the command to be ‘On’ or ‘Off’, depending on different situations. 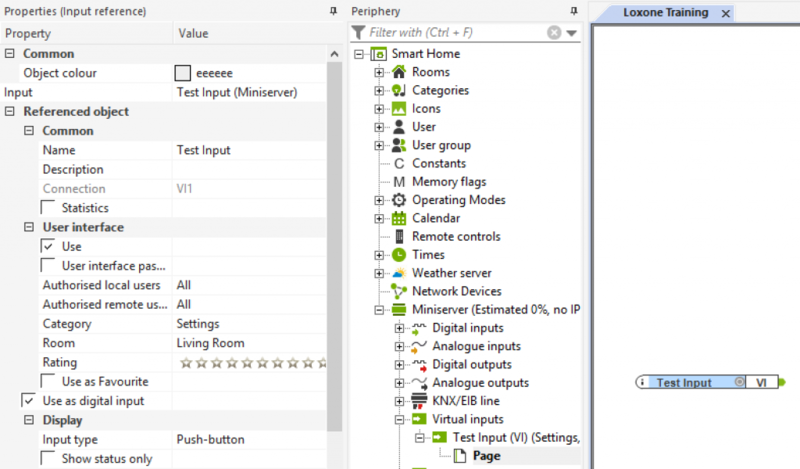 You will also see in the Loxone Interface the Push Button will change state depending on which command is sent (on/off). Function Generates an Eventserver in the Webserver. An Eventhandler must be programed in the Webclient (e.g., new EventSource (http://miniserver/dev/sps/event)). Answer Sends all the outputs that have changed without a renewed request to send. Function Enables automatic sending of status changes in WebSocket.